You don't get to see baby mermaids very often. Even mermaids sometimes debate over what baby mermaids looks like, as they're born only every few decades or so. The last rumor was that baby mermaids are formed in a large clam shell and emerge in a group, looking like little shrimps with human faces. That, of course, is semi-creepy and completely ridiculous. Baby mermaids don't come along often but when they do they are completely adorable from the very beginning. Making sure a baby mermaid doesn't get into trouble is even more challenging under the sea as it is on land. On land, you can make sure everything from your cabinets to your toilet seat is child proof. Plus, you've got a few months before your kid is moving around. A mermaid baby is an instant swimmer and for the most part, lives in the wilderness of the deep sea where childproofing doesn’t exist, though there are less coffee table corners to knock their heads against. Harried mermaid mothers need to make sure their babies aren't trying to gum on an electric eel or playing with the pretty looking jellyfish. To make it easier on yourself, take your tiny mermaid to live on land for a bit. We're sure none of your friends have met a mermaid baby before, so don't be surprised if you see gaggles of them gathering around this nautical child. With a loose, shiny skirt your little one will be perfectly comfortable and extremely photogenic. She'll even get a little starfish hairclip. 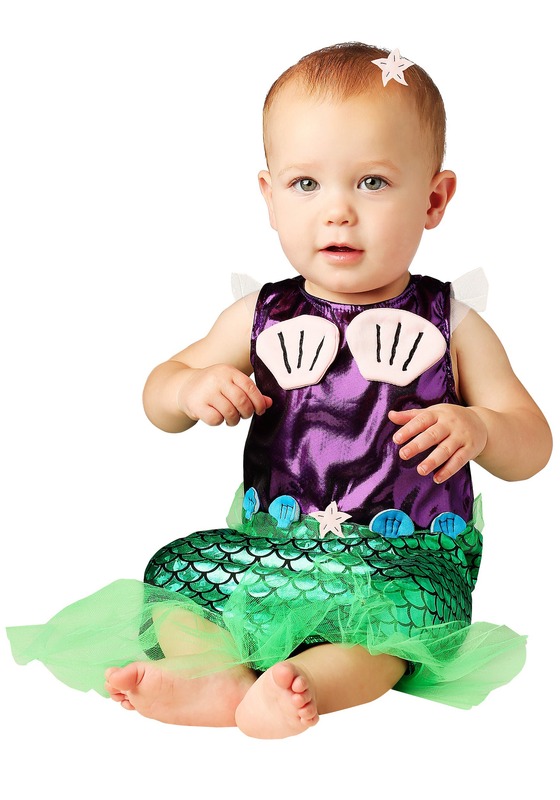 Transitioning from sea to land can be hard but whether you're dressing her up for a pool party or an oceanic photo shoot, your little mermaid is sure to become a landlubber soon enough.